SAN FRANCISCO & ATLANTA--(BUSINESS WIRE)--Jan. 30, 2019-- According to Visa’s (NYSE: V) new “State of Female Entrepreneurship” report, 79 percent of American women entrepreneurs feel more empowered now than they did five years ago, yet many still face a number of obstacles to growing their businesses. Focusing on a range of interests and priorities derived from the report, Visa is hosting its first She’s Next, Empowered by Visa event today in Atlanta, one of the fastest growing cities in the U.S. for women-owned small businesses1. “Women-owned small businesses are essential to our economy and Visa wants to provide these incredible women with tools and resources that can help them grow and advance their businesses,” said Suzan Kereere, global head of merchant sales and acquiring, Visa. Entrepreneurial motivations. The top three motivators for women, nationally, to start a business are pursuing their passion (48 percent), having financial independence (43 percent) and flexibility (41 percent). Funding does not come easily. Three quarters of women entrepreneurs (73 percent) report difficulty in obtaining the funding they needed to start their own business, with 61 percent self-funding their businesses. Results were similar for Atlanta-based female small business owners, with 83 percent citing funding difficulty and 63 percent self-funding their businesses. Open to new technology. Thirty-two percent of women would direct additional funding towards newer technology, such as digital or social media tools. In Atlanta, female small business owners would like to improve digital marketing (59 percent), social media (50 percent) and be able to conveniently make and accept payments (32 percent). Biggest challenges. Nationally, women said their top concerns include assembling a good team (37 percent) and finding the right business management tools (36 percent), also citing keeping up with industry challenges (24 percent) and building a support network (23 percent). 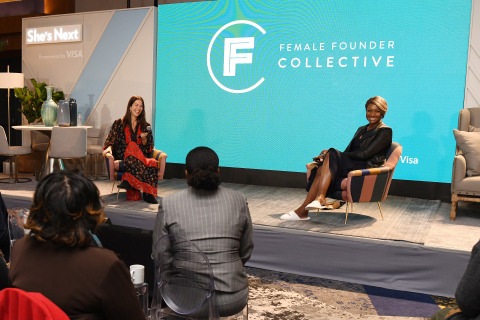 In Atlanta, women shared different challenges: 37 percent of female founders reported not being able to grow as fast as they need to, developing an online presence (34 percent) and raising funding and capital (32 percent). Battle of the sexes. Most women feel that business challenges are equally difficult for both women and men. However, some believe that negotiating contracts and raising funding come more easily for men than women, particularly when it comes to raising funding (34 percent), negotiating contracts (35 percent) and making tech decisions (20 percent). Days away from Super Bowl LIII, more than 150 Atlanta-metro area female entrepreneurs will attend the She’s Next inaugural event. The event centers around support and education through dynamic programming: town hall with industry leaders including, Facebook, Square, Yelp and Authorize.Net, keynote from Female Founder Collective leader Rebecca Minkoff, Instagram Story School, networking groups and much more. At the event, contactless-enabled vending machines will create a unique shopping experience featuring select items from Atlanta-based, women-owned small businesses. In addition, 100 percent of the purchase price of products sold from these machines will benefit Women’s World Banking, a non-profit providing low-income women entrepreneurs around the world the financial tools and resources they need to thrive and pursue their dreams. Attendees will receive a resource-filled She’s Next toolkit which includes information on how to run and improve your business from industry leaders, key resources and a description of Visa’s full suite of payment services designed for virtually every business need. The toolkit will soon be available to download online for small businesses nationwide. Methodology: Visa commissioned a survey of 650 adult, female small business owners to assess their attitudes toward entrepreneurship. The online survey included women in the United States (400) and Atlanta (250). The survey was conducted by Logica Research on behalf of Visa in December 2018.